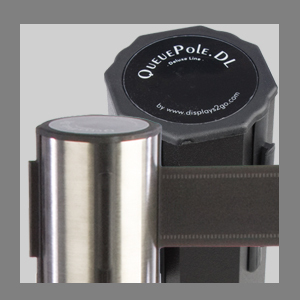 How are retractable belt stanchions useful for almost any public or commercial environment? This type of crowd control fixture is a great way to organize customers into ticketing lines, prevent passersby from entering a doorway, or separate two areas in a style. For example, these retractable belt stanchions, or barrier posts, are an ideal choice for creating queues in restaurants, school dining halls and hospital cafeterias. 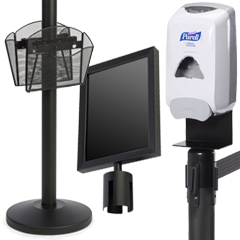 Retail outlets, banks and service organizations can also make great use of these stands for checkout. 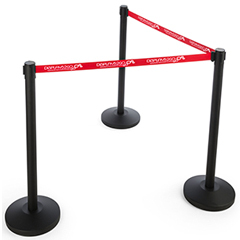 Not just useful for shops, the retractable belt stanchions and assorted accessories can also keep an event venue or trade show booth orderly. What makes this selection of barrier posts excellent for managing high traffic areas? Each of these retractable belt stanchions is made of durable metal such as stainless steel or aluminum that allows them to withstand bumps and pushes from passersby. This type of crowd control system also comes with a circular weighted base that keeps them upright in busy environments. To prevent damage to flooring, the underside of each one features a rubber or ABS plastic cover that doesn't leave marks. 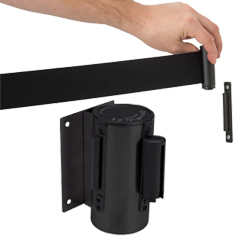 As their name suggests, these retractable belt poles come with a nylon strap that measures between 6.5' and 9.5' long. Users can connect a number of these stands to form barricades and queue lines. Each stanchion has a 3-way receiver top that allows them to form more complex layouts like crosses and T-shaped intersections. These fixtures are easy to assemble and disassemble, making transport and storage hassle free. To set one up, simple screw the rod into the base that creates a sturdy fit. The third and last part of the assembly is the strap cartridge that easily fits on top. Setting up a queue configuration can be simplified by setting down the bases where they're needed and then screwing in the rod and tape to complete the unit. Where else can these retractable belt poles be used? Any location that requires crowd control would be a great place to set up a system, from retail stores to public events. Service organizations and government buildings like the Department of Motor Vehicles already make use of them for their ability to keep a queue in order. As mentioned before, this type of barrier post is also suited for conventions, showrooms and event venues in general where they can keep interested visitors in check while they wait to learn about a company's presentation. Churches are also frequent users of these models, both large and small, for food service areas, entryways and for keeping areas exclusive to personnel. Schools, colleges and universities can not only use them in their cafeterias, but they can be used in any on-campus shop or faculty building, such as the Department of Admissions. Stainless steel barrier posts like these are also a great choice for airport terminals, where they can be placed at a number of different points. This includes the check-in counter, the security clearance checkpoints, at the gates and even at the shops located within the building. Any business that requires a ticketing line, such as movie theaters and train stations can use one of these systems. What options are available with these stainless steel stands? Our selection of barricades is offered in a number of finishes for matching any environment. For the most part, this means neutral shades like black, chrome, silver and brass. The units feature sleek satin, polished and powder coated finishes for a number of décors. 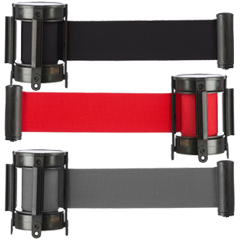 Also available in numerous colors, the withdrawable strap is offered in brighter shades such as red, blue and green while black and gray are also very popular. Barricades with custom printing are yet another option that users can choose from and they can feature printing in one or two shades. We offer bundles featuring accessories such as sign frames, bowls and literature holders that top the fixture, while these add-ons can also be purchased separately. Wall mounting models can begin or end any organization at a vertical surface. This includes tape cartridges or just receiver. Even more options are available for accommodating any business's needs. This includes clear barricades that can be filled with candy, small toys and even custom graphics for more brand recognition. Another great design is the model with two tapes, these prevent people from ducking underneath. In addition, some units have an entirely collapsible and portable design that allows the base to fold to facilitate transportation. 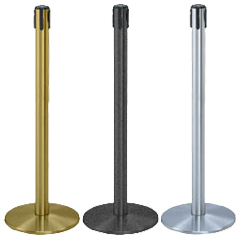 Browse our massive inventory on StanchionsDirect.com for wholesale pricing and fast shipping.